The Hampden Clubs co-ordinated massive petitions to Parliament and, in January 1817, a rally was held in London, marking the first real national co-ordination of any people's organisation of a wider character then the purely sectional trades unions. The mood of the masses was sharply rebellious - the Prince Regent had stones thrown at the windows of his coach by a crowd. The House of Lords investigated the state of the nation as the political clubs became more and more popular - especially in the Midlands and the North. While the aims of the clubs were modest at first - simply an extension of the franchise - the fear of revolution held by the ruling circles soon gave vent to repression. In an atmosphere of paranoia bordering on the absurd, the Government suspended Habeas Corpus, and the infamous Sidmouth `Gagging Acts' were passed. (Lord Sidmouth was the Home Secretary.) All public meetings were forbidden, except under licence from local magistrates. Pubs and coffee houses, as especially notorious places for radical gatherings, were covered by the Acts, as were all public places. `Sedition', that is to say opposition to the Government whether by speech or written word, was to be punished severely. As the discontent reached fever pitch, the first `hunger march' of the unemployed was organised. 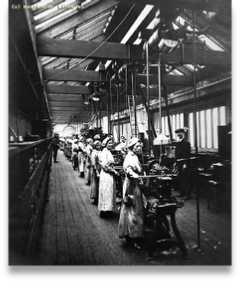 At the beginning of 1817, the textile workers of Manchester decided to petition the Prince Regent for political reform and relief of the unemployed. The idea was to march to London, over a period of six days, in order to present the petition. The men would sleep anywhere, on the ground, or in churches, but would take a blanket with them; they were rapidly called the `Blanketeers'. About 12,000, entirely peaceful, supporters of the Blanketeers turned out to greet the start of the march - but the authorities arrested a score or more of the main leaders and dispersed the crowd with troops of dragoons. Despite this, some several hundred marchers had already left, but large numbers were forcibly stopped at Stockport. 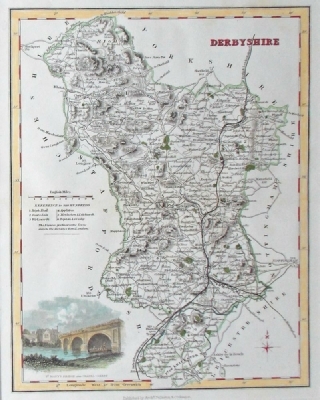 500 marchers reached Leek, but as they marched towards Derby they found the Hanging Bridge over the River Dove at Ashbourne occupied by masses of troops who were expecting an army of 30,000 rebels! Most of the Blanketeers turned away, but 25 were arrested in Ashbourne itself, and a few got to Derby; only one marcher reached London to present his petition. Throughout the spring of 1817, the Government set up a network of spies and political provocateurs. The aim would be not only to be aware of trouble, but also to anticipate it. The line between anticipation and prematurely forcing rebellion was fine. But the latter tactic would be ideal for the Government. One particular agent became famous for his work in Pentrich. As early as the attack on the Prince Regent's coach, `Oliver, the spy' was heard at the Horse Guards "inveighing in such loud and seditious terms against the Prince Regent as to collect a crowd around him". If such was so, then it is tempting to speculate as to whether one of the very acts that justified the repressive legislation was itself a `put up job'. Either way, it certainly didn't take much to inflame the crowd against the Prince Regent. Oliver passed through Derby on the 26th April on his way north. Having to wait for fresh horses on the public coach, he called upon Robertshaw, the landlord of the Talbot Inn, a local meeting place for radicals. Travelling on his way, Oliver attended a meeting at Wakefield of delegates from across the disaffected counties. 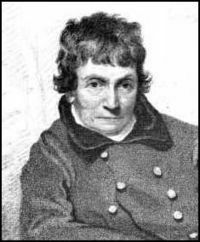 One Thomas Bacon of Pentrich was there. Once taken into Bacon's confidence, Oliver was able, a month later, to return to Derby when he stayed at the Talbot Inn. While in the town, he met with a group of six local activists in the upstairs room at the Three Salmons. Presenting himself as a delegate of a `Committee of gentlemen in London', Oliver intimated that his mission was to "ascertain the sentiments of the people respecting Parliamentary Reform". Only `physical force' was worth trying, he argued. Petitions were a waste of time. 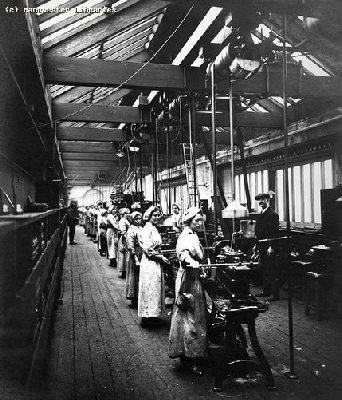 The local men responded that the country was not ready - but Oliver told them they were mistaken, "half the country is in an organised state...particularly the manufacturing districts". Some places were only with difficulty prevented from armed action, he claimed. Despite the fact that the six locals thought Derby to be "a very loyal place", Oliver asked that something be done - even only as a token. For "the business would be done in London, where sixty or seventy thousand armed men would be raised in an hour or two's notice". Pentrich was particularly vulnerable to suggestions of violent militaristic action, for local feelings were running very high. With Luddism and Hampden Clubs well established in the area, the news of the execution of seven Luddites from Loughborough and another in Nottingham in April must have inflamed opinion in the surrounding parts. More importantly, however, four men were currently due to be executed for setting fire to Colonel Wingfield Hatton's haystacks at South Wingfield, very near to Pentrich. Hatton was the local magistrate and squire, so a good deal of anger was generated amongst the commoners about the affair. 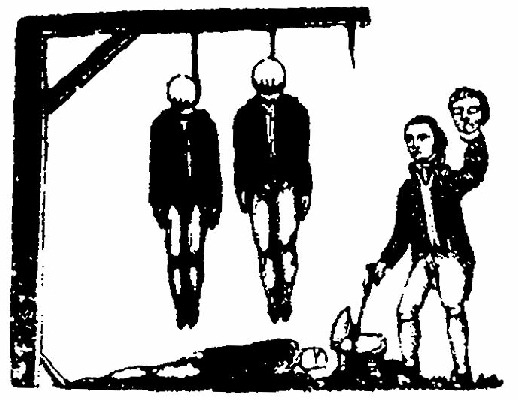 The four men, George Booth aged 21, John Brown aged 38, Thomas Jackson aged 20 and John King aged 24, all protested their innocence to the very end. One of them was buried in Pentrich in August, after the rebellion. The church funeral service was marked by bitterness. The established church, by and large, counted for little in these remote districts, newly acquiring large populations from mines and textile production, except as the most unrelenting voice of `law and order'. However, one Hugh Woolstenholme of Crich, who was the new curate of Pentrich, had sharply radical views. The authorities had scant regard for Hugh Woolstenholme; he was "of the lowest order of clergyman, uneducated, of vulgar habits, and low connects". In fact he had attended Sheffield Grammar School and Trinity College, Cambridge, but no matter - a parson had to be a gentleman, a man at least related to property-owners and often was a local magistrate. Woolstenholme, however, was a revolutionary! Various local dignitaries sensed the rising tide of anger in the area. John Fletcher, proprietor of the Ripley Brewery, made a sworn statement on the 6th June that he was upset by the "frequent private assemblies of Hampden Clubs". There had been three meetings in the previous week with over a hundred present at each one. Fletcher claimed that the "few respectable inhabitants had hidden their valuables because of alarm in the area". The local paper positively and firmly blamed the Hampden Clubs after the event, saying that Monday, 9th June, was "fixed for a general insurrection in Lancashire, Yorkshire, Derbyshire and Nottinghamshire", and that immense bodies of men, armed with guns, pikes and other offensive weapons, were to have marched out of Lancashire and Yorkshire, over the north-eastwardly side of this county and the westwardly side of Nottinghamshire, into the town of Nottingham". Such a description is so far from reality that it's oddly reassuring to find that newspapers could get it so wildly wrong in the 19th century as they sometimes do today! In truth, the establishment was well prepared for it all and there was no surprise amongst the authorities. Indeed, in readiness for the anticipated event, over 100 selected and reliable men out of the 700 employed at the Butterley Iron Works, only up the road from Pentrich, were sworn in as special constables, Similar preparations were taken elsewhere, notably at Nottingham, the supposed centre of the rebellion, but it proved impossible to provoke a response from the Hampden Clubs there of the same order as in Pentrich. Sunday 8th June 1817, Brandreth spoke at a crowded meeting in the White Horse Inn in Pentrich. Repeating, with total belief, Oliver's tale of a grand revolt about to open up all over the country, Brandreth recited some verses of his own composition. Every man "must turn out and fight for bread. The time is come you plainly see, The Government opposed must be". Calling on the men to march to Nottingham, he told them that they would each be given 100 guineas, bread, beef and ale. Over 16,000 men would rise at Nottingham and the Derbyshire contingent would take boats down the Trent to seize Newark. The rebels assembled at 10 am at Hunt's Barn in Garner's Lane, South Wingfield, to march to Ripley. 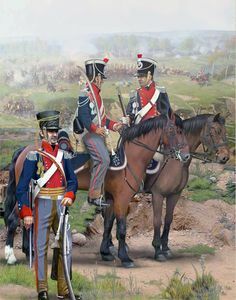 Recruits from Heage and Belper reinforced the march at Ripley and, by the time it arrived at Codnor with another 70 men from Swanwick, there were well over 400 insurgents. 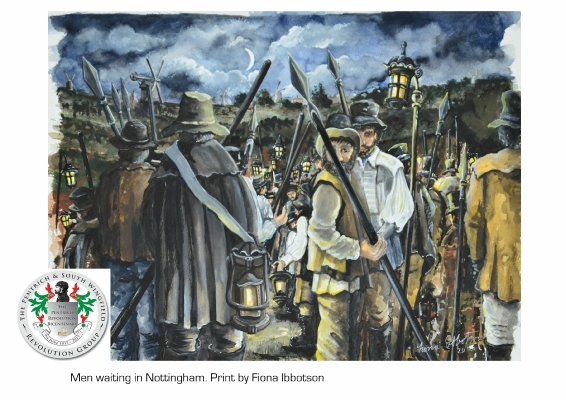 On their way to Nottingham, they called at nine or ten houses to collect arms and in one or two cases press-ganged men to join the rebellion. Most were armed simply with sticks with a piece of iron or spikes attached to them. The Government preferred to call them pikes, but the military connotations were rather exaggerated. Most carried hayforks or freshly peeled tree poles studded with nails. 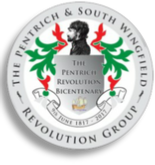 In truth the men were very sparsely armed, contrary to the claims in the local paper that the "insurgents from Pentrich possessed themselves of all the guns, and fire arms (in the district) of which they had accurate account, which were found on them". At some houses the farmers were forced to provide provisions, but not all were reluctant to assist. At Samuel Hunt's farmhouse, bread, cheese and beer were freely given by him to the insurgents. Hunt was to be rewarded with transportation for life for his generosity and involvement. At the Squire's door, violence was threatened, but not carried out, in reprisal for the forthcoming hangings in August. The Squire was Colonel Wingfield Hatton, whose haystacks had been fired in April. Then the column split into two to cover the area better, aiming to gather further recruits and provisions. Brandreth, William Turner and Isaac Ludlam took one group, while George Weightman and Edward Turner took the other. The most serious incident of the rebellion was about to take place. It was Brandreth's group that visited the home of Mrs Hepworth. The `Captain' banged on the door asking for arms, while those inside refused to open up. A few of the rebels went to the rear of the house, where a window was broken, and a random, warning shot was fired inside. 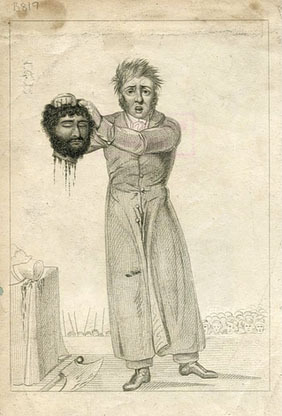 The servant, Robert Walters, fell mortally wounded as he bent down. Proof of deliberate murder was never provided, nor was there more than a suspicion that it was Brandreth who fired the shot. Moreover, no one was charged with murder, nor did anyone admit to such a crime. It was enough, however, to blacken the whole column with murderous intentions. By early morning, the two groups had come together again and had reached Eastwood. 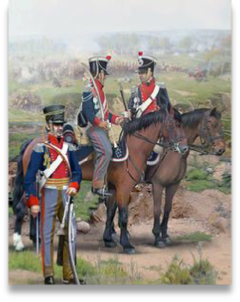 There, two magistrates accompanied by twenty fully armed men and Officers of the 15th Light Dragoons, met them. Mundy, one of the magistrates, afterwards described the confrontation: "we came in sight of the mob who though at three quarters of a mile's distance from us no sooner saw the troops, then they fled in all directions...throwing away their arms". Not a single shot was fired and, within a very short space of time, 48 men were captured.Some, however, stayed at large for quite a while. Isaac Ludlam was arrested at Uttoxeter, Brandreth at Bulwell and George Weightman at Eccleston, near Sheffield. Thomas and John Bacon were not caught until the 15th August and then only by virtue of the enormous reward of 100 guineas offered for their betrayal. The establishment now proceeded to extract retribution; it would be vindictive and effective. Within two weeks of the event it was announced that: "Ann Weightman, widow, who has kept the White Horse public house at Pentridge for several years, was convicted...of having permitted seditious meetings and, in particular, a meeting on Sunday, 8th instant", when Brandreth had called upon the men to join the rising. In consequence, her licence to sell ale was revoked, thus depriving her of her livelihood. In a similar move, the Duke of Devonshire announced a strict inquiry into the tenancies of any men involved in the insurrection. More serious would be the punishment meted out to the leaders, all of the prisoners were isolated until the time of their trial in Derby; their relatives sold everything, down to their beds, to provide funds for their defence and a committee was formed in London to campaign for their release. 46 men of Pentrich, South Wingfield, Alfreton and Heanor, were indicted at the Derby Assizes on 26th July 1817 as having committed High Treason, along with "a multitude of false traitors, ...500 or more". 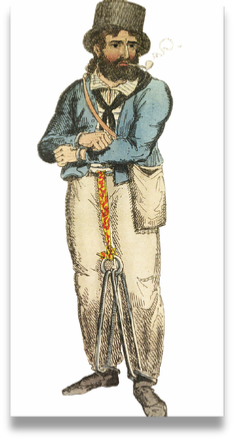 The overwhelming majority of those on trial were labourers and framework knitters, but there was one each of a farmer, tailor, blacksmith and sawyer. There were also two stonemasons. Fully eleven of those charged were still not caught by February of the next year. A Special Commission of four judges had 35 of those charged before them on 16th October 1817 at Derby. A full trial, lasting ten days, ensued, before a jury packed with rich farmers. The prosecution had deliberately held over the trial to October, until after the harvest, so that such a jury would be available. Each group of defendants faced a different jury, but the first business was the calling of a Grand Jury that had to decide if there was sufficient evidence for a case to be answered. The composition of the Grand Jury, double normal size, gave new meaning to the phrase `jury by peers'! For it was comprised of the cream of Derbyshire's ruling class: - nobility, rich farmers and textile tycoons crammed the jurors' seats. The indictment left nothing to chance for it was several pages long. The main thrust of it was that the prisoners did: "with force and arms at the parish of South Wingfield aforesaid, in the county of Derby aforesaid, maliciously and traitorously amongst themselves, and together with divers other false traitors, whose names are to the said jurors unknown, did compass, imagine, invent, devise, and intend to levy war against our said Lord the King, within this realm, in order by forces and constraint to compel him to change his measures and counsels, and the said last-mentioned compassing imagination, invention, device and intention did then and there express, utter and declare, by divers overt acts and deeds hereinafter mentioned, that is to say, in order to fulfill, perfect and bring to effect, their most evil and wicked treason and treasonable compassing, imagination, invention, device and intention last aforesaid, That's to say, by force of arms they intended to wage war against the King to get him to change his policy to one they agreed with! The prosecution held Oliver the spy, the instigator of it all, in reserve in Derby, well out of sight. All they had to do was to prove the insurrection occurred and that the prisoners were part of it. The defence, meanwhile, ineptly argued that Brandreth was misled and duped! Defence lawyer, Cross, put it like this: "I cannot help alluding...to one of the most malignant and diabolical publications ever issued from the English press...it is entitled - `An address to the Journeymen and Labourers'". Not that their defence was extremely unsympathetic to the plight of the rebels; he drew attention to the evidence of Thomas Turner, a state witness, who said nothing of the indictment's claim that the insurgents aimed to overturn the Government. "At Elijah Hall's (the) men told him they wanted a bigger loaf and better times for the framework knitters, and if this were high treason he feared that there were many persons in that hall guilty of the crime". But why clutch at straws like this, when there was hard defensive evidence? Brandreth's solicitor took a statement from him before the trial, not used by him, but which clearly identified Oliver's role. In this, Brandreth explains the Three Salmon's meeting, attended by Oliver, where he claimed that the entire country was ready to rise. 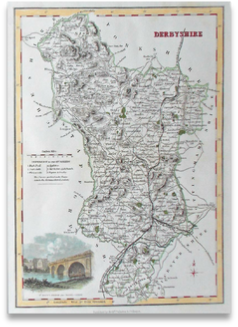 Oliver said, "he could raise 70,000 men in London...(but)...the people in London would not be satisfied unless Nottingham was perfectly secured" to safeguard the passage over the Trent for the supposed northern forces. Moreover, everyone seemed to know about Oliver's doings. 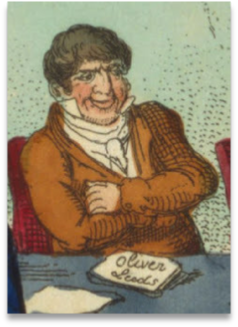 Joseph Strutt, a well-to-do local liberal, wrote in a private letter to his uncle, Lord Belper, that many wondered how it was that nothing of Oliver came out in the trial, but such was the cunning of the prosecution that, "not a single witness was brought forward against the prisoners who had ever had anything to do with Oliver. The prosecution commenced by the examination of men who had been at a meeting only the night before the rising took place, and after Oliver had left them, so that anything which took place before that time would not have been admitted as evidence". The Government had learned from previous cases that the evidence of a spy tended not to help the prosecution, for there is an almost natural aversion of people to the sneak. Moreover, if evidence is secured by devious and lying means, how could any jury be sure that the evidence was really sound? It was essential that a death sentence was reached, at least in the case of the leaders, to place on record a warning to the radical movement. There was another clever sidestepping manoeuvre on the part of the Crown; Brandreth was taken as the main culprit, and not Bacon who was, in reality, the leading radical in Pentrich. There was good reason for this move, for Bacon had set it all up, in good faith, with Oliver. To accept Bacon as the leader would mean providing him with an opportunity to mention Oliver. Bacon was induced to plead guilty in return for sparing his life and Brandreth's case was taken first. Bacon later wrote: "When I was first in prison some magistrates came, I offered to tell (them of) the affair, but Mr Lockett, the prosecutor, discharged me from speaking one word. I was the first man in the indictment, it was the King against Thomas Bacon and others. My trial was supposed to come on...first". Political dissidents had chalked up the slogan "JURYMEN REMEMBER OLIVER! ", somewhat in vain, on the walls of Derby before the trial. But Oliver's part did not come out in the trial and Brandreth was found guilty on Saturday, 18th October, after only twenty-five minutes consideration. William Turner's trial started on Monday and in turn he, Isaac Ludlam and George Weightman were all found guilty, after much the same evidence. Turner's jury was out for fifteen minutes, Ludlam's for only ten. In mitigation for Weightman, Cross argued that he was "led by delusion into a riotous assemblage... (he) ...was incapable of committing any outrageous act". The jury of ten farmers, one miller and one master cotton spinner were not especially moved. While the greater part of the other prisoners were either released or condemned to transportation, the capital sentence of high treason was pronounced on Brandreth, Turner and Ludlam. The judge made their offence clear: - "Your object was to wade through the blood of your countrymen; to extinguish the Laws and Constitution of the country, and to substitute for the liberty of your fellow subjects - anarchy". Nine prisoners followed who had pleaded not guilty originally, but who had now changed their plea to guilty. Ten pleaded guilty outright and these were formally sentenced to death, commuted to transportation and gaol. The Attorney General offered no evidence against twelve, mainly young relatives of the principals. The Chief Baron, in acquitting them, said that while he might have been pronouncing death he believed that by "taught wisdom...you will lead more correct lives... (as)...you have been misled by others". Of those that pleaded not guilty, eleven were pardoned from death and transported for life, three for fourteen years and others were imprisoned - one for two years, two for one year and three for six months. Brandreth and his colleagues waited for their deaths. 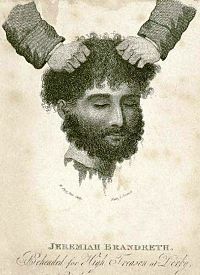 A fruitless campaign to save them was waged, for the Prince Regent believed himself to be acting magnanimously in response to a plea for clemency by remitting the quartering - they were only to be hanged and decapitated. Certainly Brandreth was outraged at the role of Oliver. Joseph Strutt wrote to his uncle, "Mr Wragg, the solicitor of the prisoners, was refused admittance to see Brandreth on Sunday last, and Lockett (not with his usual cunning) let out that he was afraid of Wragg seeing him, for that he (Brandreth) had ever since his condemnation talked of nothing else but Oliver, and that he was a murderer, etc., I hope he will speak and tell all that he knows when on the scaffold." Brandreth was a family man, with a girl of four years of age and a boy of one year. His wife, Anne, was pregnant and, being penniless, had to walk the whole way (around fifteen miles) from Sutton in Ashfield to Derby, arriving on Wednesday, 29th October, to say farewell to her husband. Brandreth’s last letter to Anne was written on the Friday morning. He left word for some money to be given to her. Finishing the letter, he sounded calm, "my dearly beloved wife this is the last correspondence I can have with you. So you will make yourself easy as you possibly can". Signing off as "your most affectionate husband", Brandreth says "adieu, adieu, to all for ever". Strutt revealed that crowds of people flocked into Derby to see the execution "and the horseguards are parading our streets", he warned. Indeed, the militia were very much afraid that a last minute attempt to rescue the three men would be made. A great force of cavalry, armed with drawn sabres, surrounded the scaffold. Several companies of infantry were also present, all to ensure that the crowds did not interfere with the judicial killings. Thousands were assembled in Friar Gate when Brandreth, Turner and Ludlam were brought out at 12 noon. Brandreth walked with a firm step to the scaffold and said to all "God be with you all and health to Lord Castlereagh". The rope was put around his neck and Turner was brought next, to say: "This is all old Oliver and the Government". 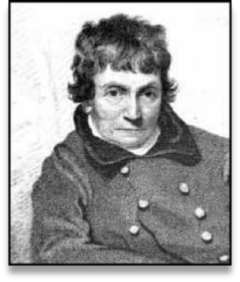 Ludlam, a Methodist preacher, merely addressed a prayer to the people. But no sign of repentance was shown by any of the condemned, despite much pressure to do so. Cobbett, in a personal letter to Henry Hunt written from America on 6th February 1818 (lodged in Derby local studies library), relates how much anxiety and manoeuvring was shown by the authorities, all designed to prevent the men speaking the truth on the scaffold. His explanation for this was that the authorities wanted the three to specifically mention himself, Hunt, as responsible, to provide an excuse to move against the leadership of the radical movement. The men were dropped from the trap to hang for half an hour. 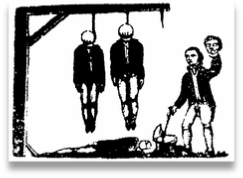 Hanging in those days did not instantly break the neck, but slowly strangled the victim to death. 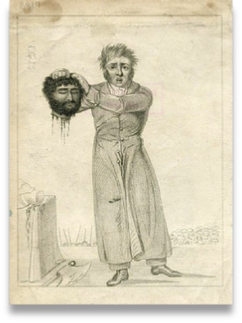 The men were lifted, eventually, to have their heads severed - the job was done ham-fistedly on all of them, for the executioner obviously unused to the task, could not sever the head from the body with the axe and had to cut it off with a knife. Bear in mind that the thirty minutes strangulation might not have killed the men. 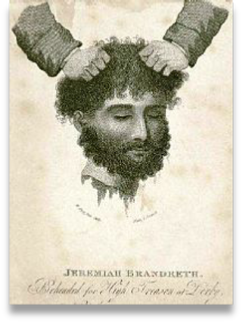 Finally, the executioner held Brandreth's head up by the hair saying: "This is the head of Jeremiah Brandreth, a traitor". Three times, Strutt relates, "there was a general expression of dissatisfaction by groans and hisses etc., The whole affair created a great sense of indignation amongst the local population, the events, Strutt thought, were "horrifying to the feelings of those who have a spark of liberty". Percy Byshe Shelley, the poet, wrote a bitterly sharp pamphlet after he read of the execution and the death in childbirth of Princess Charlotte, only daughter of the Prince Regent, in the same newspaper. The latter event was dwelt on with all solemnity as a national tragedy, the former seemed to Shelley to be the real calamity. Contrasting the private grief associated with the death of an amiable young lady with the bloody brutality of the slaying of the Pentrich Three, Shelley followed them to the grave in imagination. Conjuring up the tempo of a funeral march in his sentences, it was not the funeral of three men he saw in his mind's eye, but that of British liberty. The realism of this poetic licence has in the past caused some to believe quite erroneously that Shelley was actually present at the execution, but this was not so. Thus, a framework knitter, a quarryman and a stonemason were `privileged' to be the last recipients of such a punishment in the provinces. All three coffins were buried in one deep, unmarked grave in St Werburgh's churchyard, not far from the place of execution. It is unarguably a location worthy of some lasting memorial to three martyrs in the long fight for democracy in Britain, but sadly, to Derby's shame, there is none. As for those rebels left facing punishment, ten of fourteen prisoners left Derby gaol for deportation on Friday, 28th November; the others were left at Derby to follow on because of illness. They were all, rightly so, very bitter about their treatment, especially when they compared it to the discharge, on bail, of the only other rebels to respond to Oliver's provocation. In Huddersfield, a capital charge against others failed because the evidence relied upon was that of accomplices. Many of the transportees were able to survive the rigours of Australia, although some died as convicts. All serving life sentences received a pardon on 1st January 1835. The last surviving rebel was George Weightman who died in 1865. The future was slightly kinder to Oliver who left for South Africa in 1820, where he had a job as Inspector of Buildings. He was to die, inauspiciously, in August 1827. What of the lessons of the entire event? The political reform movement was blamed for complicity in an entirely government manufactured conspiracy. The Duke of Newcastle (who was Lord Lieutenant of Nottinghamshire) wrote to Sidmouth shortly after the march of the rebels, inferring that the authorities had deliberately allowed the event to occur: "As your Lordship is aware the plot had been hatching for some time, which we knew, and were prepared accordingly". Only by expecting an entirely different support for insurrection than actually existed would Brandreth and the men have embarked upon what was surely self-destruction. Only Oliver gave them any reason to expect otherwise, for they themselves were initially sceptical. Was it simply a government created folly? E.P. Thompson has seen Pentrich as "one of the first attempts in history to mount a wholly proletarian insurrection, without middle class support". 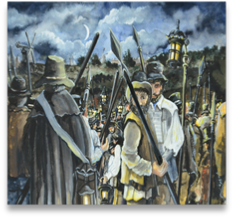 The true nature of Pentrich has been variously distorted as a rebellion, or a revolution, an expression of the desire of common folk for armed uprising. In reality, it was largely a deliberate provocation by the State. The motive? To crush the yearnings for democracy. 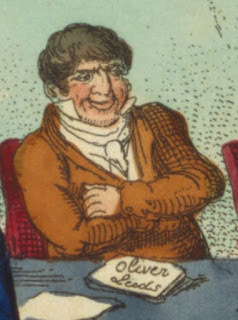 In a letter in 1831, Lord Melbourne, a former Home Secretary, recalled that there was "much reason to suspect that the rising...was stimulated, if not produced, by the artifices of Oliver". That there was a willingness of the people to take to arms, cannot be denied - that they were eager to do so can. There was not a revolutionary situation in England at that time, but there was a serious political situation. Perhaps to the modern mind, used to de-stabilisation techniques and political dirty tricks of all kinds, the notion that Pentrich was part of a government plot to justify greater repression does not sound bizarre. Pentrich happened in the days of infancy for British capitalism - but the cool cynicism of the State machine was far from childish.